By The Cupcake Faerie on August 9th, 2011 . Filed under: Cupcake Ideas, Recipes, Vegan . 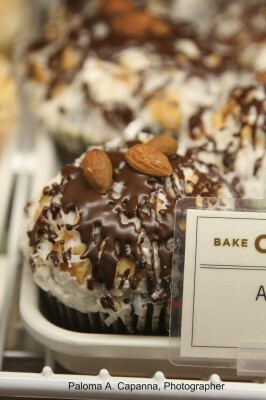 Having recently feasted on a Cumbs Bake Shop “Almond Bliss” cupcake (pictured), I thought to gather some almond cupcake recipes for you. How about a Vegan Chocolate Cupcake with Almond Buttercream and Raspberry Glaze? The “Oh She Glows” blog site has both the recipe and fantastic photographs for step-by-step instructions, including a video to guide you through piping. Or, how about Honey, Lavender, and Almond Cupcakes, complete with the directions for making your own lavender milk for the frosting? The recipe from Lily Vanilli in England is in metrics, but worth the math exercise to get you there! Finally, from the Love & Olive Oil site, let’s go for the Vanilla Almond Cupcakes with Blackberry Buttercream Frosting. This yummy recipe includes almond extract, vanilla bean seeds, and coconut milk. 1 Response to All About Almond! these look so good!!!!! i want to makje them but i dont know what it needs because it doesnt say. i willl look but these look SOOOOO GOOODDD!!!!! !